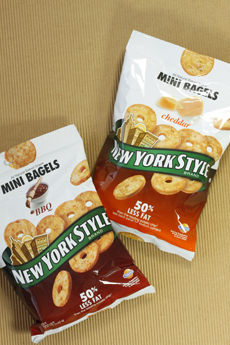 New York Style is known for its bagel chips, available in seven flavors. The company has recently launched mini bagel chips, in BBQ, Cheddar, Garlic and Sea Salt. Find the store nearest you with the company’s store locator. Find more of our favorite crackers and snacks. Mini bagel chips in four flavors: We like Garlic the best. Photo by Elvira Kalviste | THE NIBBLE.